An Egyptian appeals court on Saturday overturned a lower court ruling that designated the Palestinian Islamist group Hamas as a terrorist organization, court officials said. Hamas officials welcomed the move, which may herald improved relations between Egypt’s government and Hamas, the Gaza Strip’s governing faction. Hamas is an offshoot of the Muslim Brotherhood, an Egyptian Islamist organization. Current President Abdel Fattah al-Sisi branded the Brotherhood a terrorist group and has repressed its supporters since he took power in a 2013 coup. That coup ousted President Mohammed Morsi, a former Brotherhood leader who was sentenced to death in a separate May court ruling. Hamas spokesman Sami Abu Zuhri praised the court’s decision as “correcting a previous mistake,” Reuters reported. 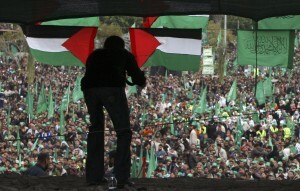 “The decision today represents a commitment by Cairo to its strong role toward the Palestinian cause. There is no doubt that [it] will have positive results and impacts on the relation between Hamas and Cairo,” Abu Zuhri told Reuters. Many countries, including the United States and the European Union member states, consider Hamas a terrorist organization. Saturday’s ruling overturned a February lower court decision that designated Hamas as a terrorist organization and accused the group of supporting a deadly Islamist insurgency in Egypt’s Sinai region. The lawyer who brought the original case against Hamas, Ashraf Farahat, told Reuters that Saturday’s decision isn’t a final blow to his cause, and said that he would petition Egypt’s Foreign Ministry to add Hamas to its list of terrorist organizations based on prior court rulings. “This ruling does not return us to zero. I have two rulings placing the Brotherhood and the Izz ad-Din al-Qassam Brigades on the list of terrorist organizations,” Farahat said. In January, an Egyptian court issued a ruling that listed the Qassam Brigades, Hamas’ military wing, as a terrorist group. Egypt has in the past played a crucial role as mediator between Israel and Hamas and is considered a key player in potential future negotiations.